View 1 is a classic dress w/lace edged collar, smocked sleeves & little rosebuds embroidered at the hem & collar. View 2 is a "fancy dress" featuring embroidery on the yoke & is trimmed w/lace & entredeux at the neck & sleeves. The hem has 2 lace bands & is finished w/lace edging. The sleeves also have lace bands. Both dresses have sweet tucks on either side of the back opeing. The slip buttons on the shoulders. 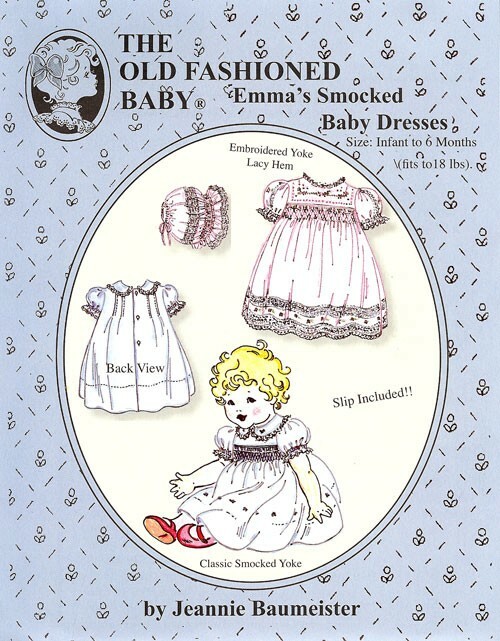 The pattern also included a smocked bonnet.